What is African theology? What are its distinctive traits and characteristics, modes of investigation, and style of expression? Can African theology reach wider and run deeper than simple propositional articulation? What concerns and special circumstances have shaped its outlook? What unique burdens or hurdles imposed by the past must African theology surmount? What challenges and opportunities lie before it? What are African theology's prospects? As a field of Christian engagement, is it condemned to be only an appendage to theology imported from the West and the North? Or does it have a distinctive contribution to make and gifts to share, not just within the continent of Africa, but also with the Christian world at large? These questions exercise the mind and soul of the African church. A worthy capstone to a lifetime of service as a theologian, educator, and ecumenical leader, this volume offers John Samuel Pobee's considered and mature reflections on issues he raised nearly forty years ago when he published Toward an African Theology. 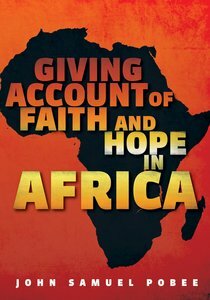 ""Giving Account of Faith and Hope in Africa is a virtual magnum opus from a pioneering authority on Christian theology in Africa... . Pobee bridges the gap between generations regarding the development of African Christian theology as both a church and academic endeavor. This volume tells the story regarding where we have come from, where we are now, and how things are likely to unfold as far as Christian theology as an African Christian enterprise is concerned."" --J. Kwabena Asamoah-Gyadu, Trinity Theological Seminary, Legon, Ghana ""Pobee brings together his amazing erudition in a wide range of fields: Biblical Studies, Philosophy and Sociology, Spirituality, and Pastoral Studies... . Here he is assured, confident and hopeful, and not apologetic. That is exactly what Africa must affirm about itself to the world. That is African renaissance. This is a must-read for any serious student of religion, especially Christianity in Africa."" --N. Barney Pityana, University of South Africa John Samuel Pobee is Ghanaian Professor of Theology, University of Ghana, and retired Director, Program on Ecumenical Theological Education, World Council of Churches, Geneva, Switzerland. He is the first person from the Southern Hemisphere to be President of the International Association for Mission Studies. Author of Toward an African Theology, Nashville: Abingdon Press, 1979 (German translation, 1989), and coeditor, Dictionary of the Ecumenical Movement, Geneva: WCC, 1981, revised 1998. About "Giving Account of Faith and Hope in Africa"